My site recently celebrated its one year anniversary (no celebration was had) and after reflecting over the blogging experience over the past year I found that it has taught me a lot about Taiwan and I have learned things that I probably never would have thought to look a bit deeper into. The temple I'm introducing today is a perfect example of how I've been a place dozens of times and never actually ‘fully’ realized what was going on inside. I'm quite happy to say that even after ten years of living here that I still have a lot to learn and through this blog and what I present to people, that I'll always be learning something and I suppose that is one of the most rewarding things about blogging. The temple I'm introducing today is the Hsinchu City God temple (新竹城隍廟) which is regarded as the most important ‘City God’ temple in Taiwan and the “provincial” (Oh how I hate that word) headquarters of all the City God temples in the COUNTRY (I like this word better) meaning that all of the other City God temples more or less need to pay homage or at least respect to the Hsinchu temple. 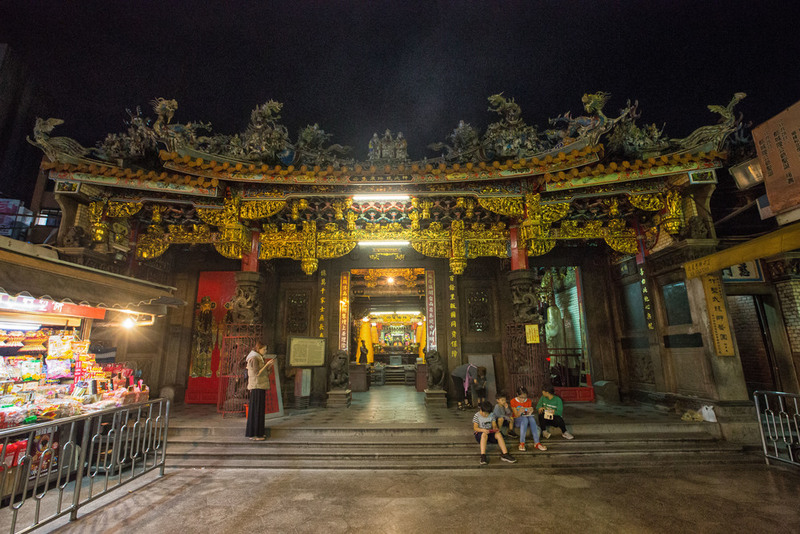 The Hsinchu temple isn't the oldest City God temple, nor is it the biggest, so why then is the so-called headquarters of all the City God temples in Taiwan? Well for that answer we have to look at the history of Taiwan and governance over the island. Hsinchu has always been an important place in Taiwan and has a history of over 400 years of development. When the temple was constructed back in 1747 during the Qing Dynasty the city was an important centre for political activity and therefore the Qing (who controlled a small part of the island at the time) designated the temple as the City God HQ for the island. 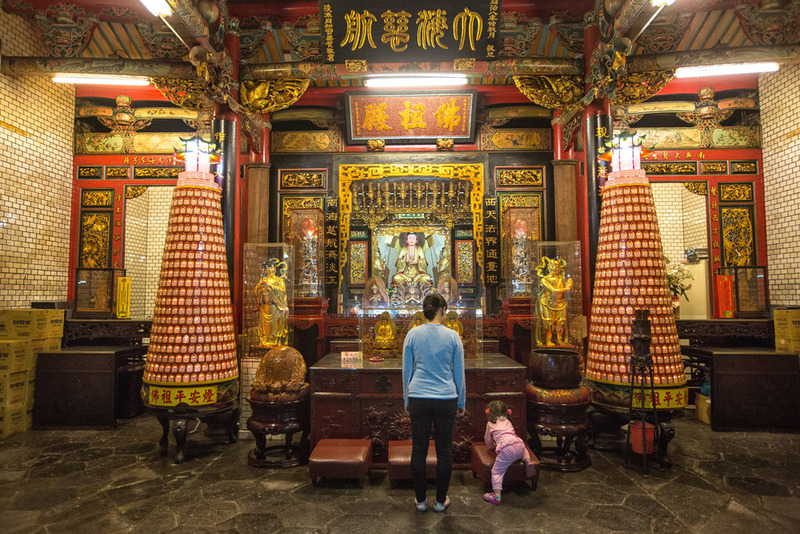 Currently there are over 95 City God temples in Taiwan with the temple in Hsinchu, the temple in Taipei’s historic Dadaocheng (大稻埕) district and the Tainan temple (the first city God temple in Taiwan) being the most important. 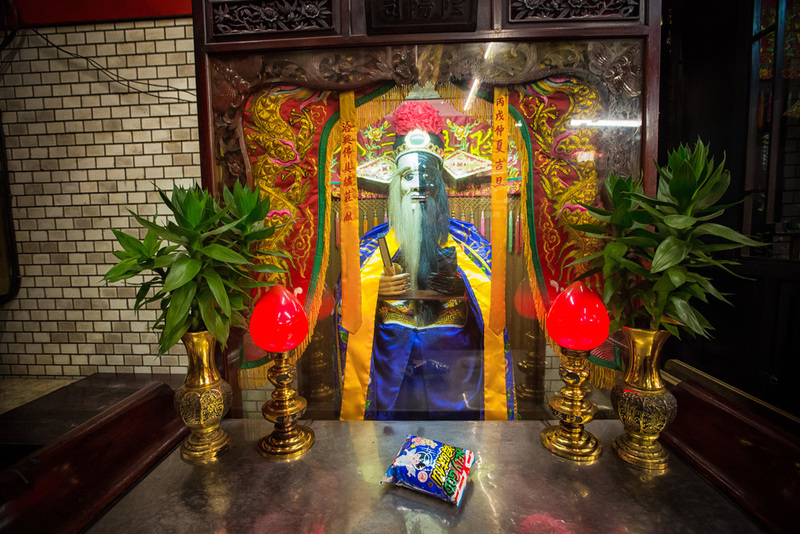 The City God, or Cheng Huang Ye (城隍爺) is an interesting figure in Taoism and is an important gods in the hierarchy of deities within the religion. His importance seems to me to be very Confucian in nature and is quite representative of ancient Chinese ideas of political ideology and methods of urban development. In the past, cities in China were walled and there were generally four different gates to enter the city with guards stationed at each gate for protection - These ancient gates are actually still visible in many cities throughout Taiwan and China and the gate in Hsinchu near the temple is pretty cool itself. The function of the City God was to act as a supernatural magistrate of sorts that would make decisions about the city (along side human colleagues), keep it safe and make decisions regarding the final judgement of citizens who lived within the borders of the city. Currently there are over 95 of these temples in Taiwan and each one “presides” over a administrative region of the country. A few centuries ago, these temples would have been off limits to the public and would only be available to local magistrates and people of power. 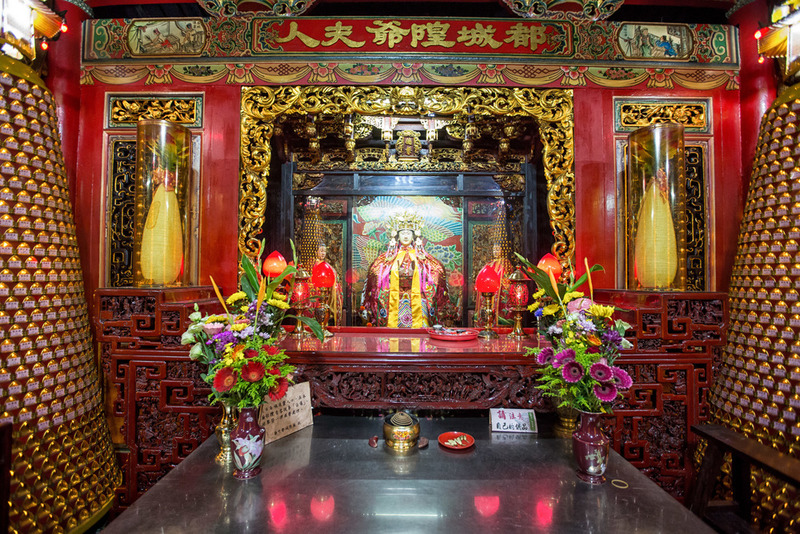 Today however things are quite different and people visit regularly to pray and make offerings to Cheng Huang Ye for keeping them healthy and safe. 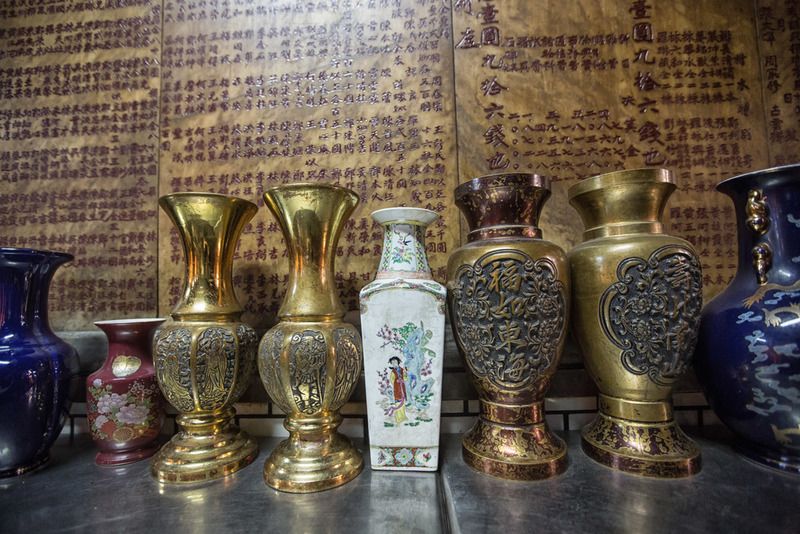 Today the temple has several shrines and inside you will find some set up to Taoist deities and important Buddhist figures. There is a shrine to the laughing Buddha (yes, the fat one), Guanyin, the Buddha of Compassion and interestingly enough, the wife of Cheng Huang Ye (城隍夫人) who is considered something of a Taoist version of Cupid. The shrine set up for Mrs. City God is quite important for people looking for romance, people looking for a supernatural way to spice things up and blessings for their marriage. If you visit the temple you’ll often see pictures of recent married couples who have visited the temple looking for her blessing. There is a traditional wet market next to the temple that is open in the mornings and afternoon and a night market surrounding it. Within the temple complex there is a strange cafeteria-like set up offering all of Hsinchu’s finest foods making the temple a one-stop shop for all things “Hsinchu”, something you don't often see with the majority of the temples in Taiwan – especially since most temples only provide vegetarian meals. If you visit the temple, I highly recommend you stop at any of the restaurants offering Hsinchu’s fried rice noodles (炒米粉), Pork ball soup (貢丸湯), Taiwanese meatballs (肉圓) and braised pork rice (滷肉飯) or crossing the street for some amazing duck noodles or rice (鴨香麵/飯) if you see a line of people waiting for something that is probably a pretty good indication that something is good at that restaurant. Now that I've educated myself about the City God and his temple, I'm quite interested to take part in this years City God festival which will fall on November 29th on the Lunar Calendar. My plan is to follow up with a part two to this blog offering a bit more information about the temple and the cool festival that will be happening outside. I have a hard time keeping track of dates on the Lunar Calendar, so basically I have to remember to check in the new year to figure out when I should be back in Hsinchu to check it out – until then enjoy these shots and I hope you learned almost as much as I did!